Home Celebrities Latarian Milton – Bio, Age, Height, Family Facts, Where is He Now? The story of Latarian Milton is quite a sad and unfortunate one which evolved before our very eyes and yet nothing tangible seemed to have been done about it. He got famous as a 7-year-old not for reasons that are laudable but one that cost his grandma a lot and could she have had her way, in her own words, she would have whipped his behind. Several years later as a teen, Latarian got caught up on the wrong side of the law once again. Though Latarian Milton might have gotten away the first time with a warning from the police and probably no spanking of his behind by his grandma, this time around, he might have to serve time in jail seeing that he intentionally committed a crime. Find out below, more about Milton and how he got to be who we know him as today. Latarian Milton is a Black American who was born in Palm Beach, Florida, in the United States of America on the 30th day of August in the year 2000. He was born to Sheneequa (mother) who gave birth to him when she was just about 16. The only description and identity found of her is that she is a chain smoker. There has been no mention of Latarian’s father and whether he has brothers and sisters. His other known family member is Vikkita Stratford, his grandma with whom he has lived for a greater part of his young life in Palm Beach, Florida. Latarian graduated from Middle School, in Palm Beach in 2015 at a time when it seemed someone had already talked some real sense into him and he was on the right path. He was excited about being in his school’s football team and looked forward to being a professional footballer. If that didn’t work out, Latarian had a second plan of joining the United States Navy where he planned to focus on engineering and technology. Before this time, however, Latarian Milton had so much trouble with himself and of course, has gone back to his old ways. He got famous when in April 2008 he took his grandmother’s Dodge Durango for a joy ride down the street after he got upset with his mom who didn’t allow his friends come into their house to watch cartoon with him. Milton said his mom asked him to leave the house and this was what prompted his action. Before he took off, he was joined by a friend of his, another 7-year-old who was smoking a cigarette and who he really wanted to do “hoodrat stuff” with. Milton zoomed unto the road with the Dodge Durango and being that he was just 8, it was a rough ride. He ran over 2 mailboxes, hit 2 parked cars in a Costco parking lot while 2 other moving cars near Wal-Mart on Congress Avenue were not spared from his haywire driving. When the ride came to an end, he was stuck in a field along Investment Lane and Consumer Drive. Palm Beach County sheriff deputies thereafter showed up having been earlier alerted by a road user who saw the kid behind the wheel. West Palm Beach Newstation WPBF visited his home and interviewed him the day after the incident and it was then he made his infamous “It’s fun to do bad things” statement which went viral when WPBF uploaded the video on YouTube. 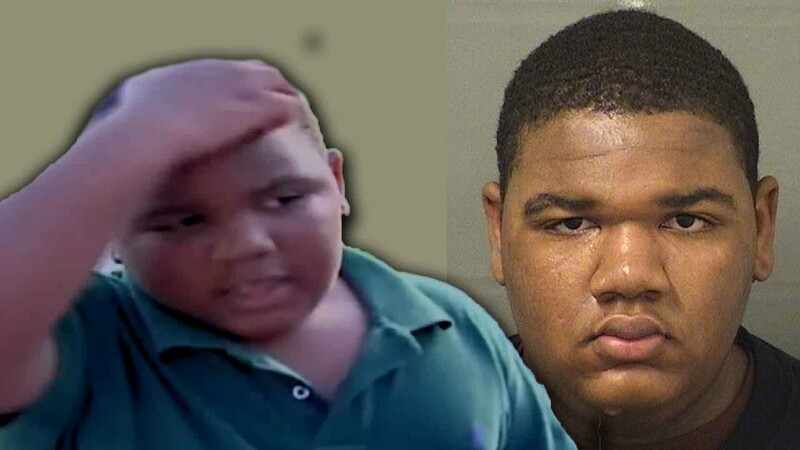 Two weeks after the incident, precisely on May 12, 2008, Latarian attacked his grandma while they were at Wal-Mart for not buying him chicken wings following which he was brought in for a mental evaluation. Latarian Milton at his current age stands at a height of 5 feet 5 inches or 1.65m. He weighs about 73kg or 154lbs. His chest measures 37 inches, his waist is 36 inches while his hips are 36 inches. Latarian’s biceps are size 14.5 inches and he wears a US shoe size of 7. Latarian Milton got on the wrong side of the law once again in 2018 which seriously put his hopes of becoming a professional footballer or U.S navy personnel in jeopardy. This time around, he was arrested for a more grievous offense; armed robbery and carjacking. In a weekend in May 2017, Latarian Milton and 4 others including a girl were picked up by a Lyft driver who Milton had earlier contacted. The driver took them to 1500 block of Windorah Way in West Palm Beach where the female alighted. The other occupants thereafter told the driver to take them to another location, but he refused. One of the 4 boys pulled out a handgun and hit the driver on the back of his head. He thereafter got out of the car and was robbed of his wallet and jacket. While this was going on, Latarian who was in the front seat got out and sat on the driver’s seat after which he quickly sped away. The Lyft driver notified the police of the robbery and also provided a phone number with which he was initially contacted for the pickup. With this phone number, Milton was easily traced and arrested. Following his arrest, he admitted to being part of the crime as a getaway driver. He was charged to court and pending his next hearing, he was put in juvenile detention. Latarian’s case looked pretty bad with the odds heavily against him. The latest information we were able to find about him dated 2018 had it that he was still in jail awaiting sentencing. With his crime, he stood a chance of getting a 15 years jail sentencing or even life imprisonment. Latarian Milton is from a Black American family. His mother gave birth to him when she was just about 16 years old. He was thereafter raised mostly by his grandmother. There has been no mention of who his father is, considering the age at which his mother got pregnant, this is, however, not surprising. He lives with his grandma in Palm Beach, Florida.